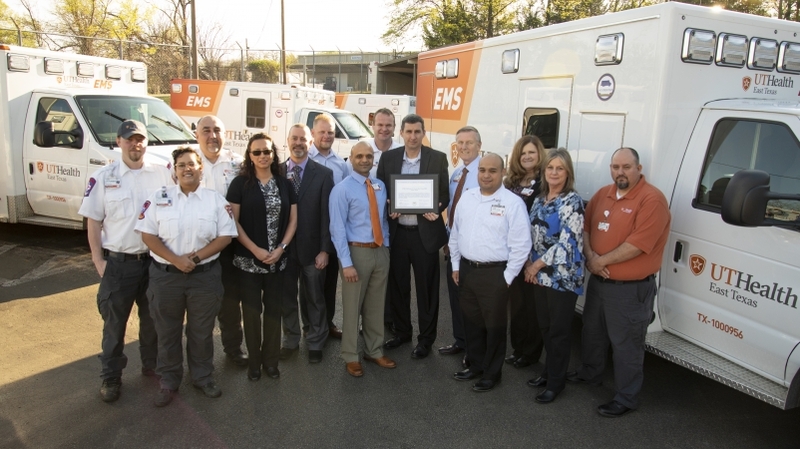 UT Health East Texas EMS has earned a fourth consecutive, three-year accreditation from the Commission on Accreditation of Ambulance Services for its compliance with national standards of excellence. UT Health East Texas EMS is one of only 180 ambulance services in the country to successfully complete the voluntary review process which, included completion of a comprehensive application and on-site review by national experts in emergency medical services (EMS). With this achievement, UT Health East Texas EMS continues to be the only accredited ambulance service in East Texas. The Commission is a nonprofit organization, which was established to encourage and promote quality patient care in America’s medical transportation system. This is accomplished by establishing national standards, which not only address the delivery of patient care, but also the ambulance service’s total operation and its relationships with other agencies, the general public and the medical community. The Commission’s standards often exceed state and local licensing requirements.